This morning I woke up and noticed melting snow on my porch, but in many ways I am not ready to let go of some of my favorite late Summer dresses, so how do you rock them for weekend wear? Throw on a biker jacket like this one to dress down a crazy pattern or a fancier dress maybe you bought to wear to a friend’s wedding this Summer. Pair with great simple ankle boots and a rustic style bag like this one from Fossil. To keep the sass in check though don’t forget your iphone case. It can always be a good accessorie. Now for those of you with black and brown pet peeves or fears. Remember as long as their good contrast black and brown can go together. I always say lean closer to camel and caramel colors for browns as it will go with almost anything. This outfit could also do well with some oxblood tights if it is extra chilly like it is here. 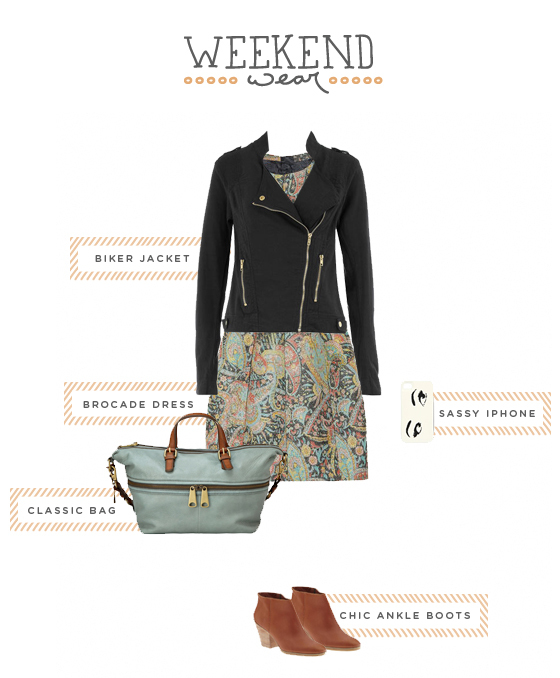 Biker Jacket from Dorothy Perkins, Brocade Dress from Net-A-Porter, Sassy Iphone Case from Kate Spade, Classic Bag from Fossil, and Chic Ankle Boots from Piperlime.